One of the 2017 style trends we have blogged about was jewel tones. Do you like to incorporate bold colours into your home’s décor? If you’re not sure where to start, read on for some inspiration. If you prefer to keep most of the colours in your home neutral, adding bold accents through textiles can make a big difference. 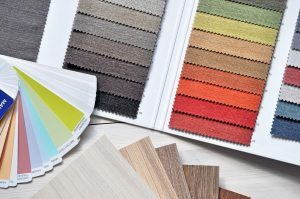 Fabrics are a quick and easy way to ramp up the colour in your home, and they can be changed out in a cinch according to the seasons or your current style inspirations. We love bright pops of colour via throw cushions, curtains, blankets and throws, and area rugs. Fresh flowers bring beautiful colour to your home, with a great scent as an added bonus. Incorporating flowers and plants into your décor keeps things fresh and lively. Try bright, vibrant florals in the summertime, poinsettias around the holidays, and soft, muted arrangements during the winter months. Stay tuned for another blog post in a few weeks about the incredible health benefits of keeping plants in your home. Artwork and photographs are a great way to add a burst of colour and drama to your home. You can find inexpensive artwork on Etsy, at local craft fairs and markets, and at second hand stores. Get creative by framing a piece of wallpaper or fabric that you love, or frame a piece of your child’s handmade artwork for a fun and personal touch. What are your favourite ways to add colour to your home? Do you prefer big bursts of colour, or subtle accents? Join us on Facebook and let us know!